Place 2 avocados in a bowl and mash them with a fork. Add the onion, chicken, mayonnaise, black pepper to taste, and the rest of the avocado. Mix until everything is well blended. Open the arepa in half and stuff it with the chicken and avocado filling. To save time, buy roasted chicken from the supermarket and shred it. 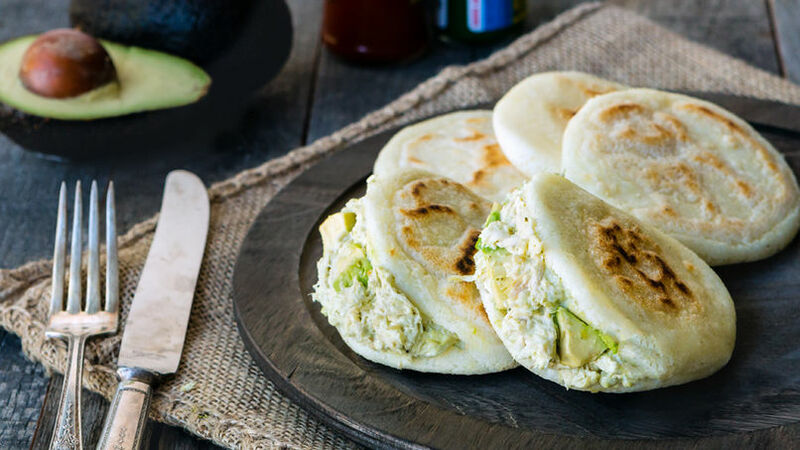 "Arepas Reina Pepiada", arepas with Venezuelan chicken salad, are a classic in Venezuelan cuisine! And with this recipe, you can make them at home anytime you want. To save time, I buy roasted chicken at the supermarket and shred it while cooking the arepas. You'll have delicious arepas, with an equally delicious filling in no time. And the best thing is that you can share these arepas with your family and friends. Enjoy!